Think you know your films? Well, every Friday we give you the opportunity to win yourself a free cinema ticket on our Free Film Friday. Courtesy of our friends at the Odeon Cinema in Taunton. All you have to do win, is answer a very simple film question which will be read out and repeated frequently between 6 and 7pm on Fridays during our Feel Good Friday show. You will also be required to submit your full name and telephone number when contacting Apple FM to be entered into the weekly prize draw. Once submitted, your entry will then be entered into a draw, ready for random selection, which will take place between 7 and 7.30pm. The winner of this fantastic ticket will then be treated to the hospitality of Odeon Cinemas which will include both standard and luxury seating and ANY 2D and 3D film. A real treat for any film fanatic. 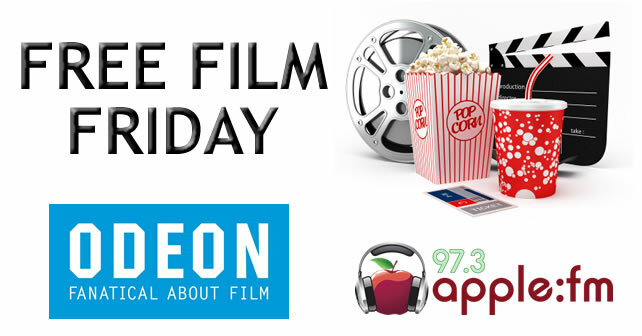 So test your Film knowledge, every Friday between 6-8pm on 97.3 Apple FM and start your weekend off with a smile with Feel Good Friday and the Odeon Cinema in Taunton. Please note, by entering this competition you are automatically agreeing to the competition Terms and Conditions which can be found here.